A child restraint system for a small child or baby must itself be properly restrained on the seat with the lap portion of the lap/shoulder belt. The laws of all 50 states of the U.S.A. and Canada now require the use of child restraint systems. 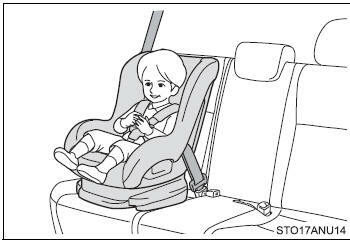 ●Use a child restraint system appropriate for the child until the child becomes large enough to properly wear the vehicle’s seat belts. speed and force. Otherwise, the child may be killed or seriously injured. 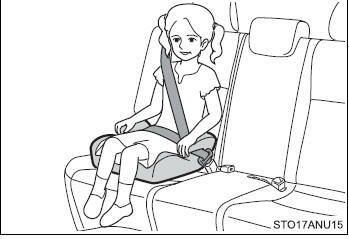 ●Do not use the seat belt extender when installing a child restraint system on the front or rear passenger seat. If installing a child restraint system with the seat belt extender connected to the seat belt, the seat belt will not securely hold the child restraint system, which could cause death or serious injury to the child or other passengers in the event of sudden braking, sudden swerving or an accident. ●Make sure you have complied with all installation instructions provided by the child restraint manufacturer and that the system is properly secured. If it is not secured properly, it may cause death or serious injury to the child in the event of a sudden stop or an accident. 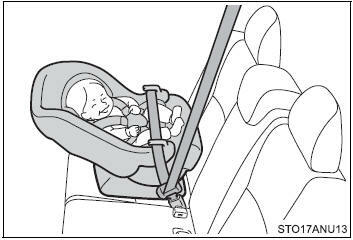 ●If it is necessary to detach the child restraint system, remove it from the vehicle or store it securely in the luggage compartment. This will prevent it from injuring passengers in the event of sudden braking, sudden swerving or an accident.